Data recovery is an operation reversed to backup, a procedure of restoring saved data to their original locations. Handy Backup allows you making quick restorative actions, from simple file recovery to returning any complex data arrays such as databases, websites or system drive images. You can make a restoration task step-by-step using the graphical New task Wizard, which governs every step of your action through a comprehensible GUI and helps to set up the particular data recovery parameters. Tune and change all that you need, to make a fully automated recovery task! By default, Handy Backup stores file copies in native formats, allowing using these files without a need for complete recovery. You may browse, move, delete or even recover the backup files manually, using any file manager such as Windows Explorer or a particular utility to recover data to a proper place. Finally, you can utilize file recovery software tasks for moving your datasets to another place. Just create a new recovery task and change location of data restored, and this task will move your data to the place that you select. Schedule this task for regular cloning data if you want to mirror or to replicate your files. 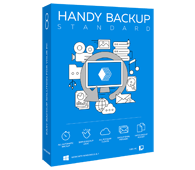 All editions of Handy Backup, starting from the Standard edition, allow quick and easy data recovery via the automated restore tasks. Here we are describing some typical tasks utilizing data recovery. Lost data recovery software tasks allow you to return some missed information to its place. Restoring after system changes helps you to rebuild data environment after re-installing an OS. Migrating and cloning, as described above, will help you to export your email and data to other storages. Photo recovery software solutions allow keeping a big photo library away from catastrophes. Disk image recovery restores a whole drive or a partition of a hard disk from the image file. There are many other examples of data recovery applications, and Handy Backup perfectly suits for each. Among these applications we can mention the database recovery, which helps an administrator quickly restoring a mighty SQL-based data structure (such as MS SQL, MySQL, PostgreSQL or Oracle). Try data recovery with Handy Backup! Download a free 30-day trial edition with all functions and plug-ins for backup and recovery of your files, folders and specific data types!